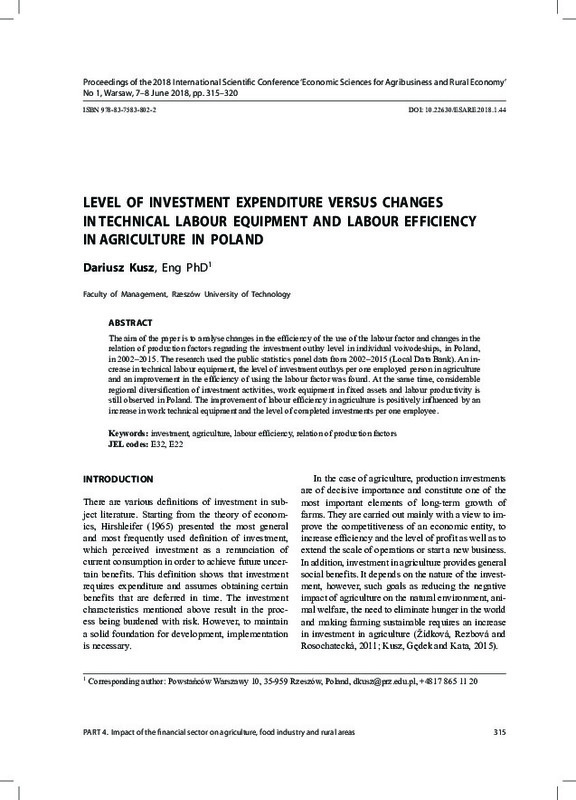 The aim of the paper is to analyse changes in the efficiency of the use of the labour factor and changes in the relation of production factors regarding the investment outlay level in individual voivodeships, in Poland, in 2002–2015. The research used the public statistics panel data from 2002–2015 (Local Data Bank). An increase in technical labour equipment, the level of investment outlays per one employed person in agriculture and an improvement in the efficiency of using the labour factor was found. At the same time, considerable regional diversification of investment activities, work equipment in fixed assets and labour productivity is still observed in Poland. The improvement of labour efficiency in agriculture is positively influenced by an increase in work technical equipment and the level of completed investments per one employee.